The SL750H PRO handset is the thinnest pro handset yet and has a large 2.4″illuminated display with an intuitive, icon-based user interface. 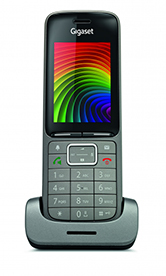 This handset delivers fantastic call clarity based on Gigaset’spatented HDSPTM audio quality. The SL750H allows users to easily control call and notification alerts with a choice of audio profiles to suit your business needs. The SL750H PRO has been given a special coating that makes it resilient to scratches on the display, handset or keys. This coating also helps to protect it from disinfectants,making it an ideal choice for industrial and manufacturing companies, hospitals and similar environments. This handset is fully compatible with both Gigaset N510IP PRO and N300IP singlecell solutions as well as the N720IP PRO multicell DECT solution.